Michigan is getting shortchanged on its job growth numbers by the Bureau of Labor Statistics monthly report. That report, the Current Employment Statistics (CES), often is used by the media because it is the most timely, but it is the least comprehensive of federal reports that track employment data. The CES lists unemployment for the preceding month and is released by the BLS every month. The CES reported 9,000 net jobs were created in the second quarter of 2013, but a more accurate report, the quarterly Business Employment Dynamic (BED) report, which was released this week, tracked net job growth in the state at 16,310 jobs over the same time period. That means the BLS' quarterly BED report had about 80 percent more jobs reported for the state. In addition to the CES and the BED reports, the Bureau of Labor Statistics also reports the Quarterly Census of Employment and Wages (QCEW). The BED is released 8 months after a quarter ends and the QCEW is released 7 months after the end of the quarter. The monthly CES report is a snapshot of employment. The CES may survey one gas station and use that as a weighted sample of 25 equivalent gas stations, said Thomas McDonald, senior economist for the BLS bureau in Chicago. The BED collects employment data from 97 percent of all businesses in the state and is a more thorough analysis. The BLS revises its CES monthly findings to align with the more comprehensive quarterly reports, McDonald said, but those corrections are seldom if ever reported in the media. University of Michigan economist Don Grimes said the monthly CES reports have been greatly underestimating the state's job growth and has for some years. 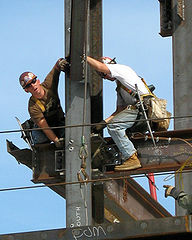 Grimes called the QCEW report "the gold standard" in measuring employment in Michigan. He said from June 2012 to June 2013 (the most recent data available from QCEW), total employment increased by 87,747 jobs. He said the CES data shows an increase of 56,700 jobs over that same period. "This 'measurement error' in the CES data is fairly large, and is 'substantively' important in evaluating employment growth," Grimes said. "The CES data says Michigan was adding jobs at a slower rate than the U.S. overall, while the more accurate QCEW data shows that Michigan was adding jobs at a faster rate than the country as a whole." How Much of Michigan's Troubles Can Be Blamed on the Auto Industry?